A new audience awaits Quiz in the West End: what could be more thrilling? Daniel Evans: A new audience awaits Quiz: what could be more thrilling? If one of the greatest pleasures of working in theatre is getting the opportunity to collaborate with living writers, then it’s doubly pleasurable to be able to share the writers’ work with a new and wider audience. I’m back in rehearsals, working on the West End transfer of James Graham’s play Quiz – and it is a real privilege. We played to sold-out houses at the Minerva Theatre in Chichester, West Sussex, during the autumn and we’re now making the journey to the beautiful Noel Coward Theatre on St Martin’s Lane. While the play and production will remain fundamentally the same, I’m mindful of the privilege we’re afforded by getting to re-examine the play with James, the cast and the creative team just a few months after closing in Chichester – and relishing the developments that might ensue. Thankfully, we have managed to hold on to most of the cast, losing just one actor due to a pre-existing contract. It’s been fascinating to welcome our new cast member to the team and enjoy watching her fresh interpretations of parts we thought we knew inside out. James has been incredibly courageous in grappling again with the play’s structure, themes and language. He shows a lack of preciousness when it comes to rewriting – paying particular attention to the minutiae of language. So much so that the actors are having to re-wire their brains to edit out a certain phrase or the odd word here and there. It’s fascinating to see how powerful our actors’ muscle memories can be in holding on to phrases that have ended up on the cutting-room floor. But their knowledge of their characters and the world of the play are ever deepening – and we hope this might make the experience even richer. We’re also playing a different kind of space this time around. The Minerva is a 300-seater, thrust stage – and we’re moving to a 19th-century proscenium arch theatre. The creative team members have been exploring how we can adapt a traditional West End space into a game show studio, the main milieu of the play. We have onstage seating and huge screens on and off stage in order to break through the ornate fourth wall. We recognise that the audience might also be different. Not just geographically, but demographically too. We’re moving from the south coast to our capital city. 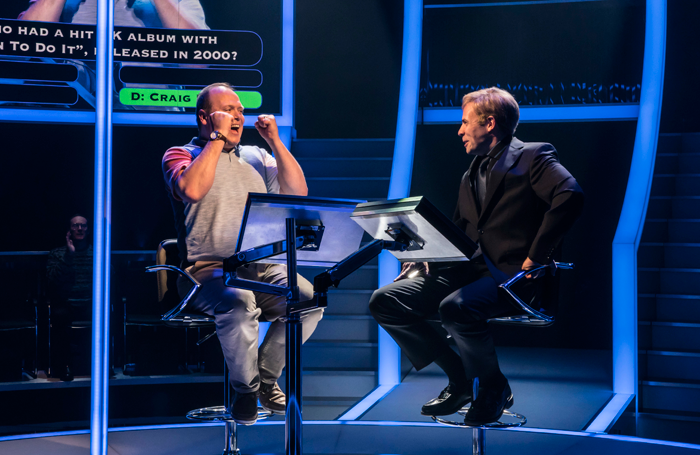 Because the play examines a notorious incident that took place during Who Wants to Be a Millionaire in 2001, we hope to appeal to a wide range of people. It just so happens that Millionaire has also been recommissioned for the autumn, though it would be arrogant of us to take any credit for that! It is also particularly thrilling that the West End – often criticised (rightly or wrongly) for its proliferation of musicals – is able to host popular new plays that have been created outside of London. The Green Room: Is there snobbery in the business towards musical theatre?